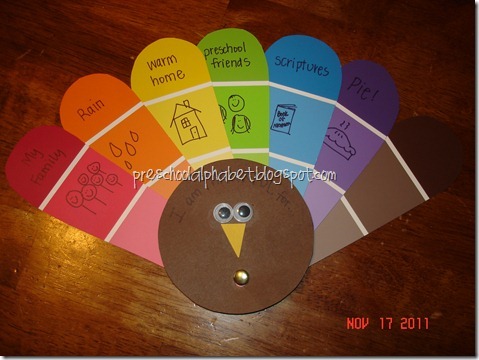 I absolutely adore this thankfulness turkey craft! I just ran into it and had to write something about it! If you have a little one at home, this is a great project to do with them! Before next Thursday, I would take a trip to Lowe’s, Home Depot, Walmart, or your local hardware store and pick up a handful of free paint chips. I know that they are there for the purpose of choosing paint, but the color gradient makes crafts look so darn cute! I, personally, love the rainbow colors chosen for the feathers. If you prefer, you could use fall colors such as gold, orange, brown, etc. This awesome idea comes from Preschool Alphabet. She has a full lesson plan available for the Thanksgiving holiday. Make sure to check it out!